The 4 Cubes is Belgium’s yearly backgammon interclub competition. Tournament director of the 4 Cubes 2019 is Luc Palmans (palmans.luc@skynet.be), assisted by Johan Segers and Guy Van Middelem. In April 2009, players from Gent and Leuven came up with an idea to encourage play between players from different Belgian backgammon clubs. This initiative became known as The 4 Cubes. It was loosely based on the Ashes (England-Australia, cricket) and the Boat Race (Oxford-Cambridge, rowing). Some fiercely contested battles resulted between Leuven, Gent and Hasselt, who joined in 2010. Today, the little red velvet bag containing four doubling cubes in four different colours has become Belgium’s most coveted team trophy. 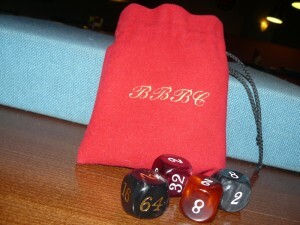 For more information, see the 4 Cubes archive of the Backgammon Club Leuven. In the years 2010 and 2011, the Belgian backgammon landscape had changed. A new club was founded in Brugge, whereas in Brussels, backgammon evenings frequently drew 16 or more players. These recent developments had brought a need with them to rethink the tournament format in order to include more teams/players in this prestigious competition. By the end of 2011, the time had come to move on to a national interclub competition. The first edition of the restyled competition was launched in January 2012. Since then, every Belgian club (or team representing a club) can compete for the title of ‘BBBC – Belgium’s Best Backgammon Club’ symbolized by the 4 Cubes trophy. Winner of the 2012 competition was Leuven, who successfully won the trophy against Gent in November 2012. Gent had been displaying those precious cubes in their club house for nearly three years, since January 2010. After Leuven’s 2012 victory, the 4 Cubes have travelled to Brugge (2013), Hasselt (2014), back to Brugge (2015), and back to Leuven (2016).